In the gaming industry, there are few companies with as grand a history as Nintendo; beyond its place as a figure of nostalgia, it’s released some of the most innovative and exciting consoles we’ve ever seen. Its intellectual property, ranging from Mario and Zelda through to Starfox and Metroid, though they tend towards the repetitive, are iconic. However, in recent years Nintendo has made some serious mistakes that can’t be redeemed by its legacy successes. Though they’ve been far from perfect it’s not been Nintendo’s products that have been the problem, it’s been Nintendo itself. From poor communication, to confusing controllers, to an inability to fully understand and respond to consumer needs and expectations, Nintendo continually stands in the way of its own success. It doesn't seem to be learning from its mistakes, either, as we're seeing these problems appear once again in the lead up to the launch of the Nintendo Switch. You don’t have to look too far back in the company’s history to start seeing evidence of its tendency towards self-sabotage; when the 3DS launched in 2011 there were complaints that the handheld and its games were too expensive. Here Nintendo had the sense to cut the console’s price to boost its poor sales and save it. This proved enough to revive the 3DS, something which was probably helped by a lack of substantial handheld competition. Unfortunately for Nintendo, the home console market wasn't quite as bare when the Wii U was released with its myriad of unredeemable problems, and nothing Nintendo did seemed to be enough to save it. Even when Nintendo appeared to have hit a home run with its hugely successful NES Classic Mini late last year, it tripped over its own laces by having insufficient supplies to meet demand. It made matters even worse for itself by poorly communicating plans to restock, thereby allowing a grey market to appear where fans paid exorbitant prices for their loyalty. Is it any wonder people are questioning the supply of consoles for the Switch already? After some mistakes with its home consoles, Nintendo had the chance to do things right in the mobile market. Bringing Super Mario Run to mobile had the potential to be huge but the fact that the game required a constant online connection was a problem for many players and showed that Nintendo had completely misunderstood the needs of a large portion of the mobile gaming audience it’s been trying so hard to court. That’s not to say Nintendo is unaware of its seeming inability to learn from its own mistakes. Fils-Amie said that Nintendo was aware that one of the biggest mistakes it made when launching the Wii U was murky messaging. “One of the things that we have to do better when we launch the NX—we have to do a better job communicating the positioning for the product," he said. When Fils-Amie acknowledged these errors, we felt slightly more hopeful for the Switch. Unfortunately, now that it’s been announced and its launch is drawing near, it appears that Nintendo is making many of the same mistakes it made in previous console launches all over again, just in slightly different ways. The Wii U’s controller might have been innovative, but before its launch Nintendo failed to communicate exactly why it was so great and why we needed one in our living rooms over, or at the very least alongside, other consoles. This time, Nintendo has undoubtedly effectively communicated what it is about the Switch that makes it unique and the many ways it could benefit those that buy it. Unfortunately, the company has concentrated so hard on pushing the big message, it’s failing to clarify small important details. We got the big idea when the console was announced at the end of 2016, so its 2017 press conference was the perfect time to get into the nitty gritty. That didn't happen and now fans are left with questions which make them doubt the console’s ability to deliver effectively on its larger promise. The most recent bone of contention has been over whether or not the Joy-Con grip that’s bundled with the console charges the Joy-Con controllers when the tablet is in the TV dock. As Nintendo hasn’t actually detailed what the grip in the bundle is there to do other than conveniently bring together the Joy-Con controllers, it’s being suggested that the bundled grip doesn’t have any charging capacity and to get a grip that does, consumers will have to purchase it separately for £27.99. Nintendo hasn’t yet confirmed whether or not this is true and we’ve contacted them to find out. Regardless, this news has already raised a fair degree of ire online as possible consumers express annoyance at the fact the only means they’ll have to charge their Joy-Con controllers in TV mode is by attaching them to the tablet unless they’re willing to pay extra. If your controllers run out of juice mid-way through a TV session, you'll need to...ahem... switch to tablet mode, whether you want to or not in order to get some power back into the Joy-Con pads. Nintendo could avoid problems such as this simply by being clear crystal clear from the very beginning. Even if this is true, by revealing that the bundled grip doesn’t have any charging capabilities last week Nintendo could have immediately calmed any anger or damaging speculation. For example, it could have reinforced the fact that the Joy-Con controllers have over 20 hours of battery life and that if players remember to attach the controllers to the tablet every time they stop playing and dock it in this 20 hour period a dying battery while in TV mode is unlikely to be a problem they’ll face. Instead, Nintendo failed to provide clarity and as a result it's relinquished control of how its design decisions are portrayed and received. To consumers, it feels like a sneaky caveat reminiscent of the sold-separately 3DS charger all over again. Outside of poorly communicating console limitations, this is another instance of Nintendo over-complicating its controllers. Alongside the Joy-Con controllers which can be used separately or brought together in a grip that may-or-may-not have charging capabilities, there’s also a wireless pro controller or a wired pro controller that have to be purchased separately. There's a distinct feeling of confusion and we find ourselves scrolling through the accessories asking "what do I need and why do I need it?" Nintendo has also once again failed to deliver a finely tuned online experience. When Sony and Microsoft are offering competitive online gaming subscriptions, Nintendo has announced one that feels oddly unfinished and it hasn’t even announced any plans for pricing to alleviate customer concerns. Sure, there’s free access to the online service when it launches alongside the console in March, but that won’t be the complete version. 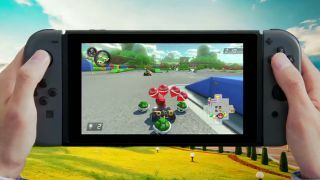 Instead, Nintendo plans to add additional features including an app service in the Fall which, annoyingly, is when the free trial period ends. Lastly, it appears that Nintendo hasn’t really learned its lesson from the error it made with the launch of the Nintendo 3DS as overall, the Switch appears to be too expensive for what it is. At £280/$299 the console doesn’t seem particularly expensive for a new console. However, its accessories and games are expensive and for anyone that prefers digital downloads to carrying cartridges when gaming on the go, there’ll be the added cost of a micro SDXC card to expand its small 32 GB internal memory. This adds to how much more expensive the Switch is compared to the more powerful PlayStation 4 and Xbox One consoles. For those considering purchasing the Switch as their secondary console this initial and potential future expense is obviously off putting. Those who are looking into purchasing a new primary console could reasonably find themselves drawn to the more affordable and consumer friendly bundles offered by Sony and Microsoft. The Nintendo Switch has the potential to be a wonderful and successful console at launch, but it has to have the support of consumers behind it. To have the support of consumers, however, Nintendo has to make its consumers feel supported themselves. Unfortunately at the moment Nintendo appears to be making the same errors all over again, clouding the excitement its innovation could inspire with a lack of clarity and the usual consumer unfriendly caveats. Check out our Nintendo Switch hands on right here!